Auchterairder (Scots Gaelic: Uachdar Àrdair, meanin Upper Hieland) is a smaw toun locatit north o the Ochil Hills in Pairth an Kinross, Scotland, an home tae the famous Gleneagles Hotel. 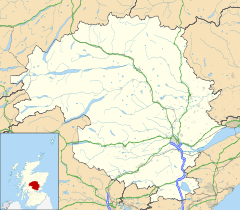 ↑ "Comparative Population Profile: Auchterarder Locality". Scotland's Census Results Online. 2001-04-29. Retrieved 2008-08-31. This page wis last eeditit on 25 Juin 2017, at 19:51.